1. Reuse everything! From boxes, to jars, to office paper! I think it is pretty common to re-use paper and boxes, but we are innovative with our jar use. At home, we like to use glass jars to store pens, markers, and scissors. They even serve as a home for our budding avocado plant! Recently at a restaurant in SF, I discovered another use for these jars—they can be used as glasses. You can even decorate them to add your own personal touch (our decorations involve Viv stickers, of course). Check out this website for ideas on how to effectively recycle unusual materials ranging from clock parts to meat packaging! 2. Set up a composting system. It doesn’t smell any worse than your trash can, I promise. The only downfall: you may catch an unprecedented “composting” cold/flu (if you can’t tell, this happened to me once while taking out a pretty gnarly batch of compost….but I can’t say that it’s a common occurrence). (a) Vokashi’s Bokashi. We recently featured an article on this easy and alternative way of composting. Vokashi is based on the process of food recycling known as Bokashi. Bokashi in Japanese refers to the process of fermenting organic matter. The method uses anaerobic fermentation to ‘pickle’ organic matter in an airtight container with a bran that is inoculated with effective microorganisms. Read our article here. (b) Vermicomposting. a.k.a worm composting. Vermicomposting uses earthworms to turn organic wastes into very high quality compost. This is probably the best way of composting kitchen wastes. Adding small amounts of wet kitchen scraps to a large compost pile in the garden day by day can disrupt any decomposition process so that the compost is never really done. But it works just fine with vermicomposting. Take a look at this video for a demonstration on how to set up your very own home or office vermicomposting system: http://www.youtube.com/watch?v=cixwGZg2YV8. (c) KinetiCompost. It’s the fastest, simplest, most eco-friendly way to create nutrient-rich compost for your home or business. Just put your compostable materials in KinetiCompost’s rotomolded barrel, pop on the lid, and let mother nature do what she would normally do—at ten times the speed! KinetiCompost is made of durable, 100% recycled plastic and steel and is eco-friendly itself. 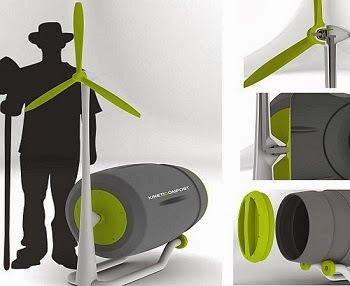 The technology behind the KinetiCompost is very simple–a gearbox (such as the one found in a power drill) is located behind the rotating windmill, creating a 200:1 gear ratio so that for every 200 rotations of the windmill, the compost barrel completes one full rotation. Now rather than turning your compost every few days, you can let the already existing breeze keep your compost in constant rotation, which translates to faster compost production and a healthier garden. Being a new development, prices and more information about this product are not available yet. Stay tuned for more information as we discover it! 3. Recycle, Recycle, Recycle. I would say we go to pretty extreme measures to recycle things here at Viv. Sometimes I even find myself rummaging through the trash to recycle things that others simply throw away. We also recycle old ink cartridges, light bulbs, and electronics. We could probably be more efficient with this though…usually one of us leaves these items in highly visible locations around the house or office, hoping that the other will take initiative and recycle it at the nearest possible location! For more information on how to properly recycle items, check out Viv’s Recycling Guide. 4. Paper Towels without the Paper. We have eliminated the use of paper towels completely from our office and home. This has reduced the amount of waste we produce significantly! Try it and see how it works for you. 5. Power. We have begun turning off all the lights behind us as well as unplugging any chargers or appliances when we aren’t using them—our energy bill has gotten a lot smaller! We are currently testing the “Smart Strip” out in our home. The power strip features advanced circuitry that not only offers excellent power surge protection and line noise filtering, but is actually able to ‘sense’ the flow of electrical current through the strip’s control outlet. Because of this unique ability, the Smart Strip can turn off selected equipment when it’s not in use, creating benefits that no other power strip on the market today can offer. Find more information here. 6. Take-Out Savvy. When we take our food to go, we make sure to return any items we may not need such as brown paper bags, plastic bags, forks, and napkins. We like to think we make a small influence on people through leading by action. We recently wrote about a campaign called TakeOutWithOut–read more here. 7. Walk the Talk. We don’t own a car; to get around, we use a zipcar, walk, or ride our bikes! Here are ten reasons why you should give up your car—and they don’t include just saving the environment: http://hubpages.com/hub/10-Reasons-to-Give-Up-Owning-a-Car. 8. Green Cleaning. We use eco-friendly cleaning products (ie dish soap, method dishwasher tablets, and hand soap). Look here for more information on how to make your own non-toxic cleaning kit for the home. 9. Green Games. Arul was recently shopping for a new basketball–he found the perfect one. Not only is it the color green, but it is made up of recycled materials as well! Read more about Wilson’s Rebound “Green” Recycled Rubber Basketball here. Those are some of the small changes we have made around the house and office but any and all suggestions are welcome! We would love to hear some of the things you do at home or at work to make your footprint smaller so tweet us @doyouviv or leave us a comment here!